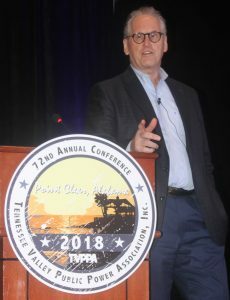 TVA President/CEO Bill Johnson addresses attendees at TVPPA’s 72nd Annual Conference, conducted this past May at Point Clear, AL. 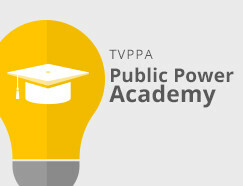 Johnson announced Nov. 14 that he plans to retire from TVA. Bill Johnson, TVA’s president and CEO since 2012, has announced his intent to retire. Johnson released a statement coinciding with a Nov. 14 meeting of the TVA Board of Directors in Tupelo, MS. Johnson said in his statement, framed as a letter to TVA’s customers, that he plans to stay at his post until his successor is in place. Noting that his “milestone” 65th birthday looms in January, Johnson said he arrived at TVA with “specific goals and aspirations.” Among those, he said, were completion of Watts Bar Unit 2, improving rate competitiveness, debt reduction, crafting a plan for pension funding and increasing customer satisfaction. A native of Kane, PA, Johnson played football at Penn State University before completing his undergraduate degree in history at Duke University. He went on to earn a law degree at the University of North Carolina. Johnson clerked at the U.S. Court of Appeals and was a partner in a Raleigh, NC-based law firm before joining Progress Energy in 1992. He took over as Progress’ president and chief operating officer in January 2005, then was named chairman, president and CEO in October 2007.